You will learn what cards are best to use for magic. We look at The Mechanics Grip which is how to hold the cards properly. I teach you The overhand Shuffle and which forms the foundation of many of the card tricks we will be learning. You will learn how to control playing cards so that you can keep track of the chosen card. The best card tricks do require some practice however the step by step lessons will teach you all you need to be able to perform amazing magical card illusions for your friend and family. 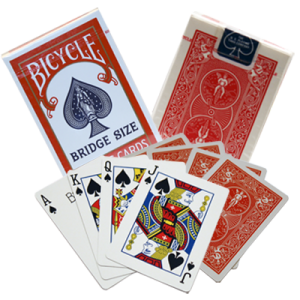 Even easy card tricks require that you commit to a practice routine to make the tricks look smooth and entertaining. I share how to make practicing card tricks fun using a practice routine that you can do while you watch TV. Taking the time to learn the sleight of hand with cards will give you a solid foundation for your card magic. Practice and perfect the moves so that they appear smooth and you can do them without thinking about them. with a little time set aside each day, you will be doing easy card tricks for your friends and family and earning yourself a reputation as a master magician.